We’re so proud! All four of our model home entries were recently recognized by the Northeast Florida Builders Association at the 2017 Parade of Homes banquet. 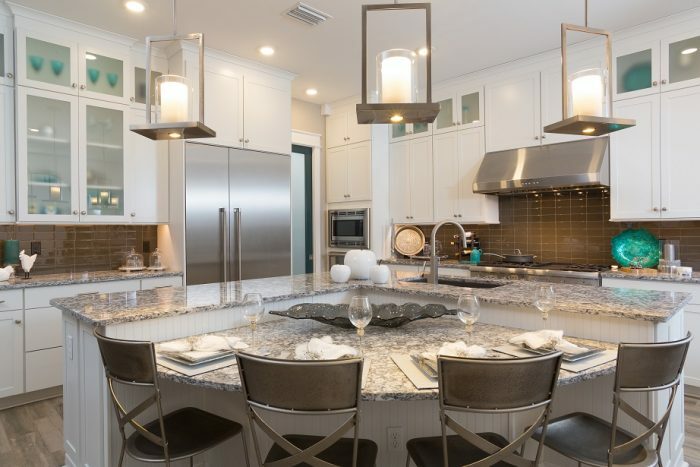 The winning Providence Homes models were The Ellaville Model in Gran Lake, The Lafayette Model in The Crossing at Nocatee and Madison & Monroe Model in The Outlook at Nocatee. The Ellaville Model located at 89 Evenshade Way St Augustine, FL 32092 is a spacious 5 bedroom, 4 bath 3,116 sqft home featuring Tray Ceilings in Main Living areas w/ Crown Molding & Plank Board Trim, Study, Family Room, Gourmet Kitchen/Café, Pocket Office, and Bonus Room w/ Bath, Covered Patio, and 2-Car Garage. The Ellaville received a HERS Index Rating of 52 with an estimated $115.33 per month total electric bill rating for 3,116 sqft of living space - estimated annual savings is $933.00! The Lafayette Model located at 63 Woodview Court Ponte Vedra, FL 32081 in The Crossing at Nocatee is a spacious two-story 4 bedroom, 3.5 bath 3,049 sqft featuring a Study, Dining, Family Room, and Gourmet Kitchen/Café, Butler’s Pantry, Private Family Loft, Covered Patio and 3-Car Garage. The Lafayette received a HERS Index Rating of 52 with an estimated $124.00 per month electric bill rating for 3,049 sqft of total living space! The Madison Model located at 44 Spanish Creek Drive Ponte Vedra, FL 32081 in The Outlook at Nocatee is a spacious two-story 4 bedroom, 3.5 bath 3,426 sqft home features a Study, Dining, Family Room, and Gourmet Kitchen/Café, Butler’s Pantry, Private Family Loft, Covered Patio and 3-Car Garage. The Madison received a HERS Index Rating of 50 with an estimated $118.00 per month electric bill rating for 3,426 sqft of total living space – estimated annual savings $1,027.00! The Monroe Model located at 58 Spanish Creek Drive Ponte Vedra, FL 32081 in The Outlook at Nocatee is a spacious 4 bedroom, 3 bath 3,943 sqft home featuring a Library, Family Room, and Executive Chef Kitchen/Café, Wine Cellar, Bonus Room with Full Bath, Solitude Spa Owners Bath, and 3-Car Garage. The Monroe received a HERS Index Rating of 52 with an estimated $135.00 per month electric bill rating – estimated annual $1,083.00 savings verses comparable code built home. All four Providence Homes models are ENERGY STAR® Certified and built with a new innovative conditioned attic system. By applying foam insulation under the roof deck and making the attic part of the conditioned space, many of the undesirable conditions found in a traditional unconditioned attic are eliminated. The end result is greater energy efficiency, lower energy bills, increased moisture control and potentially a much healthier living environment. The 2017 Northeast Florida Builders Association Parade of Homes was one of the largest ever, with more than 100 model home entries throughout Northeast Florida. All four winning model homes are open daily Monday-Thursday & Saturday from 10AM-6PM and Friday & Sunday from 12-6PM. Call 904-337-5236 for details or additional information.